RETURNING CREATIVITY COACHING CLIENTS ARE WELCOME. Please e-mail your inquiry about available services. creative energies you didn’t know you had. After years of facilitating others' creativity, through one-on-one mentoring, workshops and retreats, Connie developed a reliable creative stimulus for writers, teachers and creators of all ages. In quicksilver fashion FAME prompts ~ Focus, Awareness, Momentum, Expression ~ rouse creative productivity. Spontaneity and imaginative responses occur naturally. Order the pocket-size muse for solo or group play. Have fun with your creativity! Group and Solo Players Say . . . The cards challenge the boundaries of a set mind. I had the opportunity to explore dusty locks of my writing . . . go beyond the door. Interesting: the forced idea in flow. That is, the cards force me to do a certain thing. The cards make you think and go to other parts of your imagination. I can have fun - don't take the act of writing too seriously. 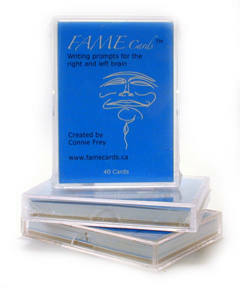 Playing FAME was stimulating and catalytic. There's value in spontaneous writing exercises, bypassing the intellect (figuring out beforehand what to write). The Momentum cards prompted me to get going and keep going.